The Planet Bike A.R.S. Anatomic Relief Bike Seat is a uniquely shaped bike seat built to a high quality standard with amazing inbuilt designs and technology to provide a comfortable and orthopaedic sitting configuration which comes useful when riding non-stop for long hours. It employs an anatomic relief design that utilizes an ultrasoft padding embedded in a recess locates in the seat centre all mounted on a flexible base for support. This makes it eradicate aches and soreness encountered from bumps on the road or trails with ease. This seat provides an all-round comfort for different bike users and is also well priced. Utilizes the A.R.S. Anatomic Relief design for the bike seat which functions well to prevent the numbness and discomfort encountered during any kind of biking. A uniquely shaped groove in the seat with a recess located in the middle that runs length-wise to provide for proper ventilation and relief to anatomic pressures. Ultrasoft seat padding mounted on a base with flex capabilities to allow for support and comfort. The Planet Bike A.R.S. 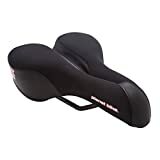 Anatomic Relief Bike Seat is a very robust bicycle seat that features a unique design for easing aches associated with biking for long hours or on bumpy terrains. The material are fairly decent in quality and may not last long as expected depending on how it is used, however it does a very good job in terms of comfort and flexibility. It provides adequate support for the sit-bones without exerting too much pressure on delicate parts in that area and the recess in the middle of the seat does well to provide decent ventilation. Overall, aside from the questionable durability in the materials used, for the price, this seat comes recommended for a comfortable biking as it will truly sooth and reduce numbness during rides.